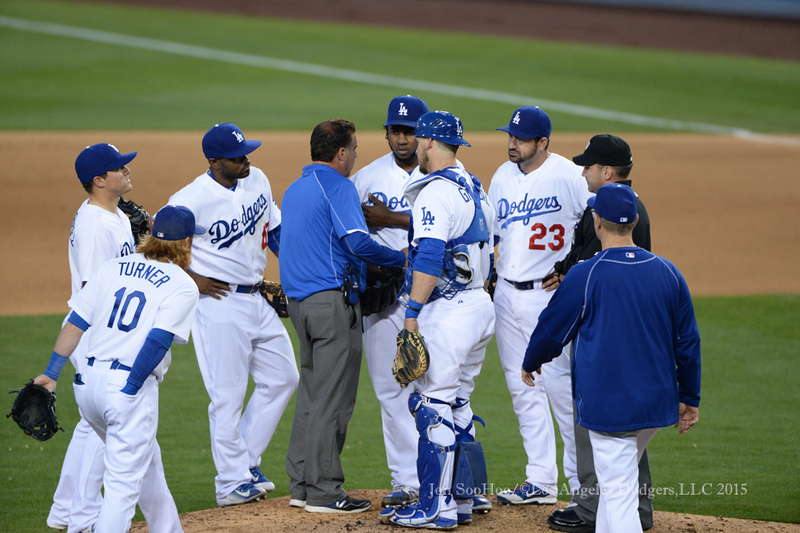 For images from Wednesday, visit LA Photog Blog. Just as the Dodger bullpen is poised to welcome back Kenley Jansen, the team has had to place Pedro Baez on the disabled list with a right pectoral strain. For now, Daniel Coulombe has come back to the Dodgers from Oklahoma City, while Jansen’s return, originally scheduled for Saturday, could be moved up to Friday as circumstances warrant. Jansen aced his final rehab assignment with two strikeouts in a perfect inning for Single-A Rancho Cucamonga. Don Mattingly, who had been ejected from the game earlier after a call against the Dodgers was not overturned by replay, was watching on television from his office, and said today he wondered if something was amiss with Baez when he saw him throw consecutive changeups to Dee Gordon. Baez had struck out his three previous batters. On the next pitch, Baez threw his slowest fastball of the game (admittedly, still 94 mph, but down from 99 mph six pitches earlier), and Gordon smacked it for a double, and next thing you knew, Yasmani Grandal was calling for Stan Conte. Mattingly wasn’t happy to lose Baez, even with Jansen serving as a de facto replacement, but he did acknowledge that the mid-May rest could be a silver lining over the long haul of the season. “With so many guys throwing mid-to-high 90s, stuff happens,” Mattingly said. As for the replay controversy, Mattingly said the team received a phone call from MLB admitting that Giancarlo Stanton’s catch of Howie Kendrick’s sinking liner in the bottom of the fourth should have been overturned, but the Dodger manager pledged he was moving on.